If stubbornness is a resistance to life itself, then it is a resistance to everything within life, and this includes a relationship. This is a very destructive trait. How it works in a relationship is not to be taken lightly. To make matters worse, the stubborn partner cannot see the destruction, because he/she is blinded by ego, selfishness, pride, rigidity and self righteousness. It is impossible to change when we are blinded by what we need to change. The decisions of the stubborn are mostly always non inclusive of their partner. If he/she allows input, it will be a waste of time, because the stubborn partner only seeks input to have the final say anyway. This is a form of control. He/She will have the audacity to say, just for the sake of saying, you were asked to give input. He/She takes comfort in the fact you were asked. There is a rebuttal to every way and there is mostly always refute to a new idea. What is unnerving is he/she never really understands, until it is too late, (if that) the many ways the relationship is being destroyed. Understanding takes insight, and such a perspective is far from one who has a myopic view. Insight is no where in sight. Stubbornness has a mental block to seeing and accepting a different or better way. So when it comes to trying to create a resolve, the relationship will spin on the same cycle, and with the same unresolved issues. Resolve can only happen by the approval of the stubborn. We will find that creativeness, openness and anything relating to newness, renewal, change, modification, and varietal thought or ideas rarely works in the mind of the stubborn one. Being unmovable is more of what he/she is all about. Pride is a side affect of stubbornness. It is a part of the partner’s false sense of self. The more his/her way is accepted, the more validation of being right he/she feels. This is how the delusion starts to takes root. I’ve seen stubborn husbands, wives, and partners in leadership roles. I’ve seen them in organizations and churches. Having a position or being in an organization where they are respected embeds and perpetuates their indoctrination of self righteousness. Stubbornness has the same long term results each and every time: desertion, withdrawal, frustration, relationship failure and ostracization from the ones they Love. The “I am right” myopic perspective simply becomes unbearable. 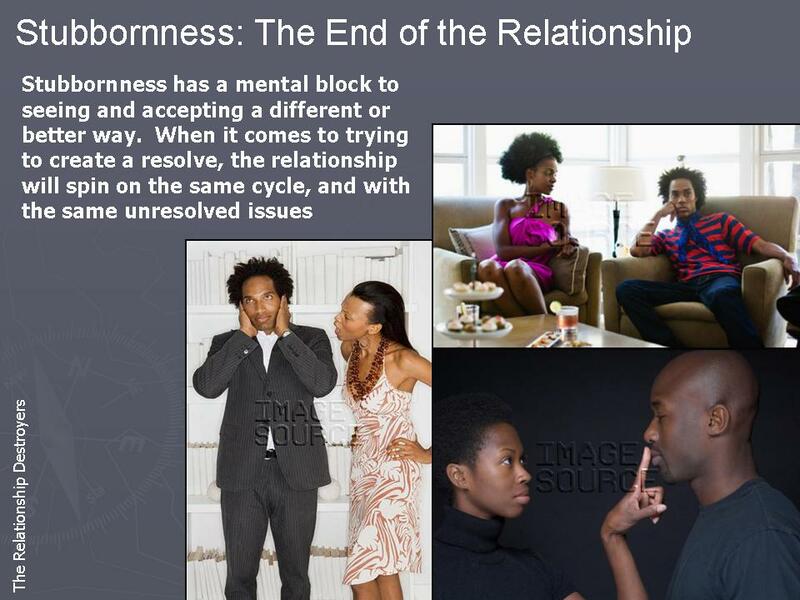 The person in the relationship with a stubborn partner, gets tired of the fight, and begins to shut down. This starts the break down of the communication channel. Fighting with stubbornness only ends with stubbornness. It is simply easier to give in. This poses a bigger problem. Giving in, creates a false perception of acceptance. The perception of accepting stubbornness perpetuates the behavior. In truth, the partner is allowed to be this way. His/Her partner permits stubbornness. Of course it is more peaceful to accept the stubborn partner’s way. Now, both partners are the reasons for the relationship failing. One provides the destruction. The other allows it. Being in this relationship means many self sacrifices. It guarantees a limited experience in enhanced thought, progression and emotion. Love may be present, but boredom with rule with predictability. Frustration will dominate the relationship due to inflexibility. Stubbornness minimizes their partner by making the final ruling on what is and what will be. Stubbornness appears strong, due to the firmness and rigidity on the stand he/she believes. But in truth there is weakness, insecurity, and fear to adapting to new environments and continual change. Being blind to self is one of the reasons why a change cannot come. These destructive actions bear the question if the relationship is really built on Love? Stubbornness has different ways in which it is worn, but the results are still the same. One variation is outright obstinance and control. Another is methodical and calm. Another variation is the stubborn partner, who will listen, with minimal fight or response. Regardless, you will either feel that you were heard, but adamantly dismissed. Or there will always be an excuse, along with garbled logic as to why your input was minimized, disregarded or tossed. Bottom line? One sided decision. Try asking the stubborn to shift a focus or a particular view, they will immediately become defensive in thinking you are asking for them to change. Dealing with this partner type comes with a host of characteristic flaws. It takes a lot of yielding with minimal and empty returns. The moodiness of the stubborn is a lot to bear. Eventually, the time will come, when the yielding partner gets tired of being tired, and simply leaves. Leaving actually provides a sense of freedom and a new world of unlimited options and possibilities! There is only a temporary solution, because in the end the long term solution lies in the hand of the stubborn partner who needs to make many changes. Dealing with a stubborn partner will take lots of patience, humility, a separate life, understanding, and insight to see the layers of insecurity, with the patience to cope, and the hope to hold on for a change or modification in the boxed mind of a partner who is ultimately resistant to life. This entry was posted in Destroy and tagged dealing with a stubborn partner, how a relationship is damaged or ruined because of stubbornness, Stubbornness in the relationship. Bookmark the permalink. I had never thought about the effect of stubbornness on a relationship. This has given me new insight and I can identify with what you say. I suggested my partner was inflexible. His reply “no, I’m not. I just never go out on a Friday”! Thank you for this post. Wow! His response of “no” shows the resistance to “know”. Thank you so much for reading! Thank you for such an insightful piece. I have been living with a Stubborn for almost 8 years, and it has taken quite a toll on me. We have recently begun going to marriage counselling and it has been somewhat helpful so far, but I know we have a long road ahead of us. I am hoping that sometime in the future he will consider going to individual counselling, but as a Stubborn, he won’t see any reason for it. Many of the issues that we face revolve around his expectations as a wife and stay at home mom, as well as around money. The fact that he is the one bringing home the bacon exacerbates the issues. An example: We have been together for 8 years and have 3 kids, our youngest being 2 years old. From the beginning, his idea on what constitutes a well kept home have been slightly different than mine. I am by no means a slob, but with 3 kids it is a challenge to tackle everything that needs to be done in the home on a daily basis. Something tends to not get done. Our home sometimes looks very “lived in”. We have argued incessantly about this, and brought it up in counselling. His thoughts are, “Why should I lower my expectations?”, but fully expects me to step up and meet them. And when I consistently don’t, very heated fighting erupts. I have called him stubborn, but he just says that I’m the stubborn one. In counselling, the therapist wondered about meeting each other in the middle with this issue and he still refused to budge, again saying that he shouldn’t have to lower his expectations. There are so many other examples of his stubborness that have resulted in huge fights, and I am starting to shut down and just concede. But then that makes him mad because I won’t change to fight for our marriage. Again, I should change be he shouldn’t have to. He once said to me that he takes my less than acceptable housekeeping very personally because it shows him that I am not invested in the marriage. Oh boy. I’m hoping things are going better after a little over a year? I’m just following up with you. If there is anything I can help with, and I can, please feel free to reach out. This whole page has been a massive eye opener! My boyfriend and I suffer from some of these ‘stubborn symptoms’ we disagree on a few things and it’s always a struggle to come back from our arguments. I’m more of a calm, logical person when putting my opinions across, whereas he gets heated and starts saying crazy and judgmental things like for example, where I would say “I’m not that kind of person in my opinion I see it like this” he would say “people like this and that I wouldn’t associate myself with, they’re a waste and so on” he doesn’t understand how judgmental he is and how some of the things he says you can’t take back. He’s got a sharp tongue verging on disrespectful and it’s mainly or indirectly aimed at me and when I reply with “how can you say that if your sitting next to me and my opinion is the same thing your undermining he wouldn’t have an answer. Also when we have a disagreement or I feel he’s tone comes across rude or harsh I will always express this to him and we won’t speak for a long time because I’m upset and angry that he thinks it’s ok to be that way with the only person that treats him with the upmost respect! One recent situation we had was really petty but we didn’t speak for atleast 2days whilst still being in eachothers company. It’s awkward and I feel like it’s not my place to bring us back to normal when he caused it in the first place. But he feels as though he always has to say sorry and make peace and I never do that. When I’m not the cause of a problem it’s hard for me to take responsibility and I struggle to do this just so we can be ok again that to me feels like he will never get the reason I’m hurt by his words, actions or attitude. I want to be able to express this to him but each time I do it’s falls apart when the next disagreement happens. In general we really get on like best friends and love eachother to death, we don’t put eachother through serious predicaments we both care about eachother but these small petty things just eat away at me and I don’t know how to deal with this constructively! I’m open to change and I consider myself a deep thinker whilst still maintaining a positive outlook on things! I personally have a lot of experience with this type of person. The truth is, unless he matures in the area of his anger/frustration he will continue to say things that are intended to be hurtful; and he will continue to be an adolescent in not using his ability to channel his anger/frustration in a constructive way that will progress the conversations rather than create a disruption to the relationship. The hurtful responses he uses shows a lack of self confidence. That lacking comes from something in his life he’s not quite conquered. His communication skills are not stemmed from logic and reasoning. They are based solely in his feelings, which is why he says the things he knows are inappropriate— even hurtful. You are right. You apologizing for the problems he creates, does not allow him to take ownership of his mistakes. He will never own them that way. Even if you apologize, his same behavior will become apparent again, because he has not learned. There is a middle ground you can use. Like saying truthful things to him in small doses, that will rattle him a little. I say in small doses, because most people who say hurtful things aren’t capable of handling the truth that hurts them. Your goal is not to be hurtful, but to verbally rattle him a little in order for him to understand the impact of what he says. There may be small victories in this, but unless he knows how damaging his actions are, there will not be a permanent turn around from this. I’m a stubborn person, according to my boyfriend, that does not know how to change. This is what i am use to. I’ve slwsys been this way..never going down without a fight and it was a character i liked about me, being in the business world and all. It was just up until i got into a relationship that i started noticing that i am stubborn. Me and my partner are constantly fighting everyday and its draining, honestly speaking. I’ve gone in and out of hospital because of the stress, tension and anger. We have tried so many times to be better people..but its just too hard to change. I love my partner with all of my heart but i’ve just gotten to a point whereby I feel like death is the only way out. I’ve tried my best into loving him and respecting him. I’ve tried to always be calm and not too quick to reply but he constantly just continues to poke me over and over and over again with words and the moment i speak back its over i’m no longer listening to him now im as stubborn as i can ever be and i throw him back with mean and harsh words. He says im the problem but how can i be the only problem to our problems and suffer this way? I dont know what to do. May I start by saying please – please see a professional (psychologist/therapist) if you feel death is the only way out. It is not. Don’t focus on the way out, focus on the way up! Life is too wonderful—despite what we hear and see in the news and from those in our lives. Life is always so much bigger than what we’ve chosen to make within our lives. There are so many beautiful people in the world to meet and so much to do than for you to spend your time stressed. Don’t focus on stress— focus on success! Please study yourself daily! Tony Robbins is a huge inspiration to me. Check out his video on “Master Your Mind Habits” https://www.youtube.com/watch?v=2wK7Kmbi518. There are many awesome videos done by him. His lectures will move you to do what you want to do. If you’ve not checked out Tony’s documentary called, “I Am Not Your Guru”, I suggest you check that out as soon as you can. You are not the only problem. It takes two to fight. If you are stubborn, then you are. I won’t make that call for you. The problem we all encounter from relationship to relationship, is we fail to continually and only bring the best of who we are to the relationship. If we focus on bringing the best of who we are, we will always work to be the best, to continually bring the best. Trying to change for someone else rarely works. It’s just not enough daily motivation. I don’t look at changing myself for anyone. I do my self work every-single-day to be outstanding, because I have goals for myself to meet personally and professionally. This produces great results for everyone in my life. Everyone receives the best of me, because I work at being outstanding. But, I do this only for myself. Lastly, know that stubbornness is a form of insecurity based in fear. Why be dead set on anything— even at the risk of being wrong, when there are so many options to win?? Stubbornness is “self” being in the way. Please get out of your own way by being open to the best option, not just your option. Unless your options and your ways of living have produced great success for you personally and professionally, then you aren’t living your best option. Open your mind and heart to the win wins in life! Thank you Leuva Mayur. Our relationships are in more turmoil now than ever before. One of the biggest problems is trying to be individualistic in a “pair” meaning in a relationship. There is no individual platform in a relationship! For people to think in this way is a red flag from the start. Being stubborn, thus resistant to anything in the relationship that brings togetherness is not only stubbornness but also selfishness. Selfishness. Another problem that cannot move the relationship to a state of well being. Thus, another Destroyer. Creating a looming doom for what should be a party of two! Thank you for reading! Very interesting reading through these comments. I feel I’m very much a victim of a partner who is stubborn, but absolutely cannot see it. Is there a way to make them aware? I feel like our relationship is like a constant battle and about point scoring. I’m not able to voice my opinion without being deemed stubborn myself. I think we all have an element of stubbornness within us, and are true to ourselves and our thoughts and feelings, but I’m very much willing to adapt to suit a relationship and my partner is not. He sees it as ‘conceding defeat’ rather than seeing anything as an element of compromise. Wonder if it’s worth trying to talk it out or if ultimately once a stubborn, always a stubborn!